Thank you to Fruit Shoot for sponsoring today’s post, our fun and opinions are all our own! I love a good competition, and I love even more when my kids get excited about it and come up with some great ideas for participating. I recently learned about a cool new competition from Fruit Shoot, where they are asking participants to create a 30 second or less video of their kids being active! Of course I had to enter, and my kids and I came up with a great little activity to use as our entry. 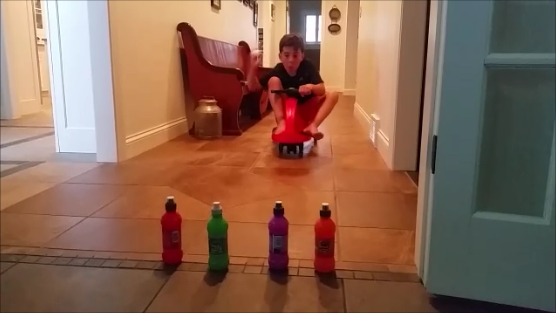 We decided to use their plasma cars in a little race around the house, but as they turned the corner they had to be sure to ‘take out’ a bottle of Fruit Shoot! This one was all about aim. My son was a pro – got his on the first try, and swung around the corner to come back and do it again. All in all we had fun setting this up and trying out our little activity. Visit the contest homepage to upload a video of your kids showing off their best tricks, stunts, and super-cool abilities with a Fruit Shoot bottle and any ball. To qualify, please make sure your video is under 30 seconds. Check out the stunt video that is already souped-up for inspiration! Share your video with friends and family and encourage them to vote for your video. Every week, Fruit Shoot will chose a winning video, give it the full-on Hollywood special effects treatment, and release it on contest homepage for the world to see! Entrants will receive a free bottle of Fruit Shoot when entering the contest. Entrants will also receive a Waboba ball anytime they buy 6 bottles of Fruit Shoot in-store. The fun hydration drink is perfect for energetic, independent kids who desire fun on the go. It contains real fruit juice, natural flavors, no high-fructose corn syrup, and no added sugar.